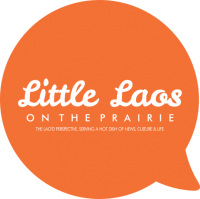 When I first moved to Fort Worth, Texas in July 2013, I was told that there was vibrant Lao community nearby. In fact, according to the U.S. Census, there are about 10,000 Laotian Americans in the Dallas-Fort Worth Metroplex alone. Out of that 10,000, about 3,000 reside in the Fort Worth Area. I was excited; perhaps adjusting to life in Texas wouldn’t be too hard with a Lao community nearby and most of all, Lao comfort food readily available right around the corner. A quick Yelp! search led me to Sikhay Restaurant in Northeast Fort Worth. I decided to take the 20 minute drive out there and check it out. The restaurant was located on a non-descript corner of a strip mall, right next to a Lao hair salon and a pawn shop. The sign up top looked like it was hand written decades ago. I walked in and ordered Larb Dip, Gang Kao Lao, and Khao Niew. As you can probably imagine, the restaurant had that home grown type of feel. It was a large room with old-school checkered tiles and mismatched décor, with ceiling fans instead of air conditioning. The food itself was hearty and delicious; the authentic flavors took me back to fond memories living in the motherland. I decided to go back a few months later, but they were closed for remodeling. When they finally re-opened months later, I was pleasantly surprised. The new décor, including vibrant colored walls, spacious booth seating, and mounted canvas pictures of Lao landmarks gave it a modern and upbeat feel. 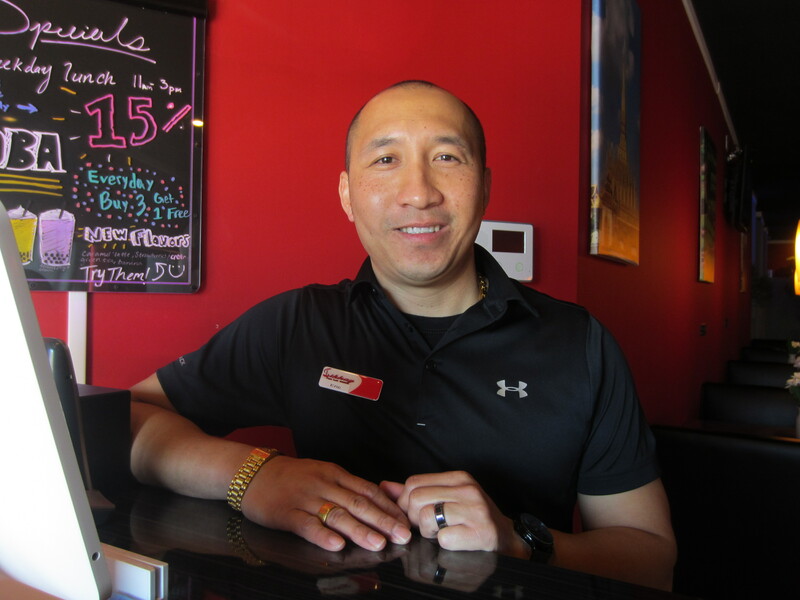 I had the chance to catch up with Eric Virakhone Panya, former member of the Navy and Air Force Reserve, and owner of Sikhay Thai Lao Cuisine. He and his wife inherited the business in 2013 and decided to take the restaurant to a whole new level. Eric stands in front of a large canvas map of Laos with his nephew, Noah, who also works at the restaurant. Many customers who come in end up taking pictures with the map. Eric says that the map serves to educate people about Laos. Tell me about yourself. What was your journey like and how did you end up in Fort Worth, TX? My name is Eric Panya; my Lao name is Virakhone. I was born in Ban Sikhay, Vientiane Capital, and arrived in Fort Worth, TX when I was 12. My uncle sponsored me and my sister and we arrived here in 1989. I was raised by my uncle at a house right here behind the restaurant. I am married with two daughters. My oldest daughter also works at the restaurant. How did you become the owner of this restaurant? What kind of changes did you make when you became the owner? One thing we realized was that a lot of people complimented us on the food, but they didn’t want to come here and eat. So I actually took a survey and asked customers what would make them come and dine with us. They said the atmosphere needed to change. I brought in a friend who’s a design engineer who worked with us to draw out a plan. We started remodeling in November 2013 and finished around May 2014. Another thing we changed was the menu. We talked to the cooks and asked them for ideas of dishes to add to the menu and what would bring people into the restaurant. We added more Thai food because we know most people would like Thai food. We also brought in more traditional, hard-to-find Lao food like jaew het and khao jee tha khai. We also asked the cooks to be flexible so if customers come in and want something different, we can cater to their tastes. What has been your biggest challenges as a restaurant owner? Everything. Planning. Thinking about how we are going to survive for the next 5-10 years. Setting goals, being ready for changes. Training cooks and employees and maintaining the building so it’s up to date with the local laws and regulations. The hardest part is probably keeping up with new trends and making sure we cater to our clientele. A lot of Lao-owned restaurants in America are marketed as Thai restaurants. What’s your choice in branding this as a Lao restaurant? We want to keep it authentic since my uncle opened this as a Lao restaurant. Thai food is just so popular now so that’s why we put Thai Lao food. What’s cool is that when there are singers or performers from Issan [Thailand], they usually eat here. If it said Thai food, it wouldn’t attract them as much. The reason why they want to come here is for the Lao food. What advice do you have for other Lao Americans who want to want to pursue the restaurant business or are interested in promoting Lao cuisine? I think it would be a great idea. I would like to see Lao food getting up there just like Thai food. We are a small country, not a lot of people know where Laos is. I want them to know the culture. Everybody’s got to eat, right? You just got to find the right location. If people don’t want to open a Lao restaurant, at least introduce their friends to Lao food. Sikhay Thai Lao Cuisine is located on 3301 NE 28th St, Fort Worth, TX 76111. For more information, visit their Yelp! page or check out their menu on GrubHub.